Four and a half years later, American troops are dying in Niger. On Oct. 5, U.S. Africa Command announced that four Army soldiers with the 2nd Battalion, 3rd Special Forces Group out of Fort Bragg, including two Green Berets, were killed and two wounded in an ambush (a partner nation member was killed as well) while “providing advice and assistance to Nigerien security force counter-terror operations” 200 kilometers north of the capital city of Niamey, on the Niger-Mali border. U.S. Africa Command has yet to release details on the nature of the attack, but the New York Times notes that those al Qaeda militants in Mali have repeatedly conducted border incursions into northern Niger in recent months. Although their deaths are not the first among 3rd Special Forces Group troops in the country (Warrant Officer 1 Shawn Thomas with the 1st Battalion was killed in a vehicle accident in February 2017), they represent the first known U.S. casualties under hostile fire in the country. But those deaths shed a harsh spotlight on a little-discussed battlefield in the war on terror — and with Green Berets reportedly “all in” on battling militants in Africa as the 2nd Battalion gears up for its second deployment in 12 months, it’s a battlefield that could see even more U.S. casualties in the future. A U.S. Army Special Forces weapons sergeant observes a Niger Army soldier during marksmanship training as part of Exercise Flintlock 2017 in Diffa, Niger, Feb. 28, 2017. 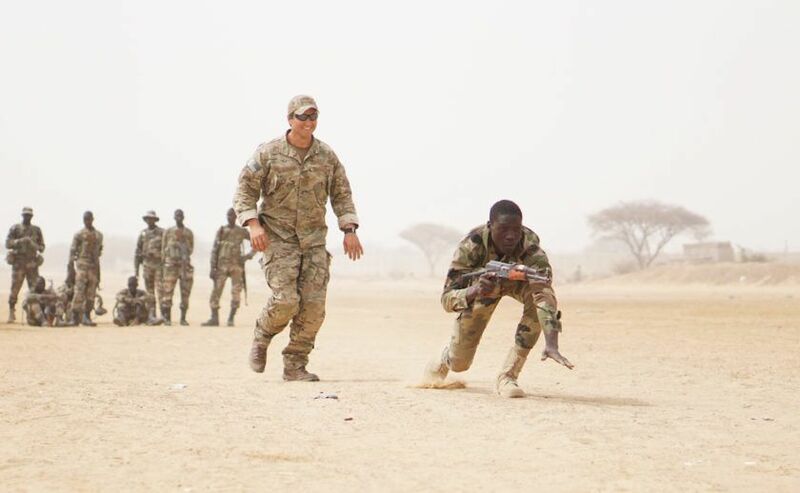 Niger was one of seven locations to host tactical-level training during the exercise while staff officers tested their planning abilities at a simulated multinational headquarters in N’Djamena, Chad. The United States has had military personnel in Africa as part of those ever-expanding “advise and assist” missions and military exercises in the service of the Global War on Terror for years. 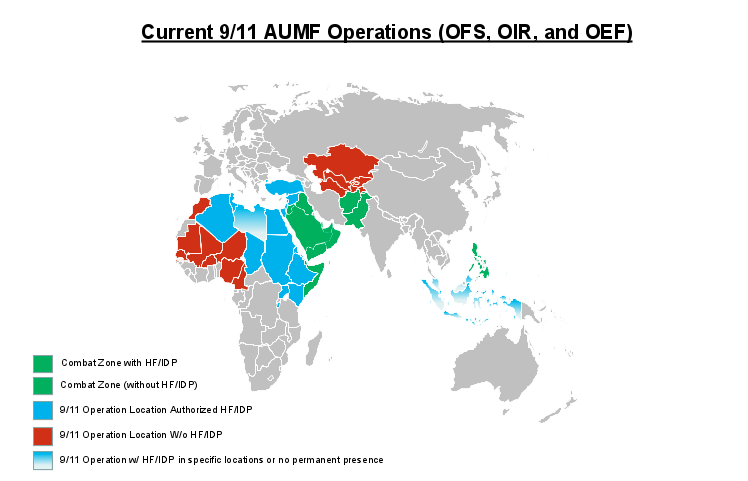 Military operations in West and Central Africa — which began in 2004 under the President George W. Bush and Secretary of Defense Donald Rumsfeld’s secret al-Qaeda Network executive order, Operations Enduring Freedom – Trans Sahara executive order, and an AQIM executive order — are being conducted under the authorities of the 2001 Authorization for the Use of Military Force. The drone base itself originated in a Status of Forces Agreement security agreement between the United States and Niger shortly after the French intervention in Mali in January 2013. 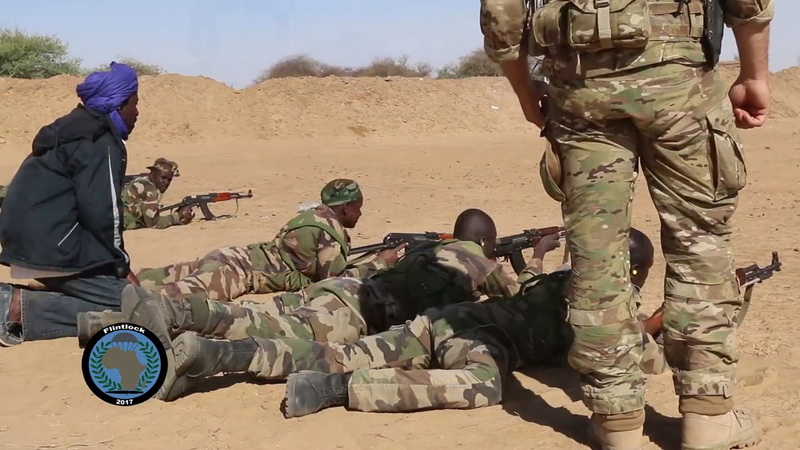 But it’s worth noting that, even in the context of the ever-expanding Global War on Terror, that the U.S. military presence in Niger stands alone from conventional campaigns against terror groups like al Qaeda and ISIS in its ambiguity. Unlike other counterterror missions, the Obama administration never explicitly invoked the 2001 Authorization for the Use of Military Force as the legal basis for troop deployments against loosely defined al Qaeda “associates of associates,” despite its use for other counterterrorism missions in countries like Djibouti, Yemen, and Somalia. Instead, Obama justified the intervention based on the 1973 War Powers Resolution that requires frequent updates to Congress on efforts in Niger, his most recent of which, in December 2016, indicated the United States had 575 military personnel in the country and a second drone base — although U.S. forces there were technically not authorized to use lethal force. Despite this, nobody really discusses the U.S. military presence in Niger. The republic doesn’t show up in Congressional Research Service discussions of al Qaeda and U.S. counterterrorism policy in the Middle East and Africa, or analyses of the potential legal and constitutional issues surrounding the executive branch’s compliance with the War Powers Resolution, or the outgoing Obama administration’s lengthy December 2016 memorandum outlining its legal framework for military force abroad. It’s rarely discussed in Congress, or by White House talking heads. In a June 2017 letter to the Speaker of the House and the President Pro Tempore of the Senate, President Donald Trump mentioned there are 645 military personnel in Niger "to provide a wide variety of support to African partners conducting counterterrorism operations in the region." It's two lines in an extensive letter outlining U.S. military counterterrorism efforts around the world. 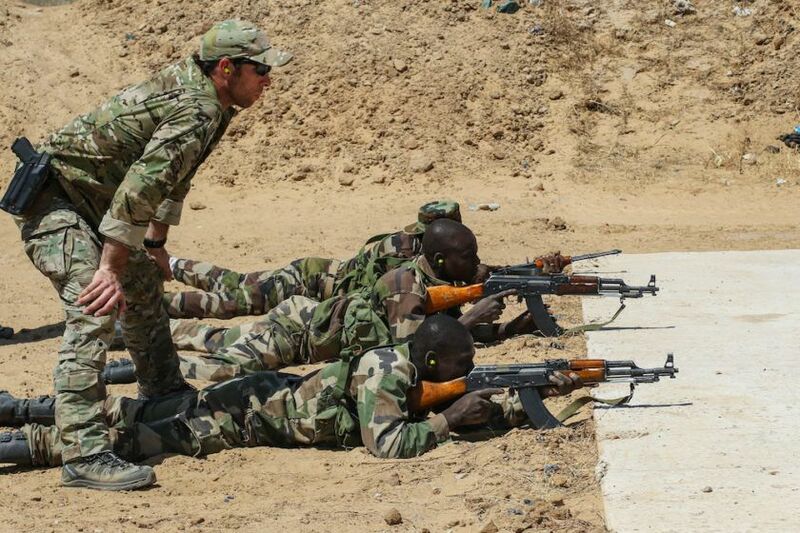 There’s a simple reason for this: Since the mission is focused primarily on training Nigerien military personnel, there are no explicit combat operations that might require congressional authorization. The best example comes from a New York Times Magazine profile of then-Africa Special Operations Command chief Brig. Gen. James B. Linder as he and his Green Berets fought to create “zones of resilience” where populations are safe from militant influence. 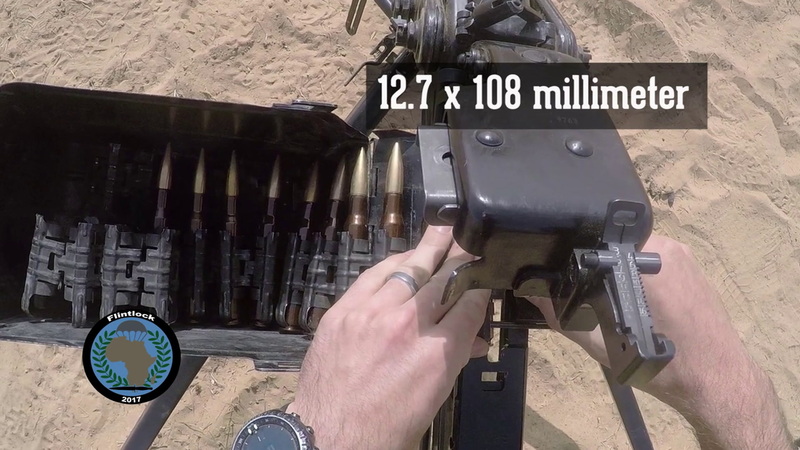 But the deaths of four Green Berets by hostile enemy fire, increasing border incursions by Al Qaeda fighters over the border with Mali, and increased military operations against neighboring terror threats like ISIS in Libya and Boko Haram in Nigeria might force the Pentagon to change not just its strategic calculus, but the rules of engagement when dealing with increasingly ubiquitous militants — escalating the mission in Niger, for all intents and purposes, into a shadow war, a new nascent front in the Global War on Terror. A U.S. Army Special Forces weapons sergeant observes as a Nigerien soldier bounds forward while practicing buddy team movement drills during Exercise Flintlock 2017 in Diffa, Niger, March 11, 2017. Flintlock is a Special Operations Forces exercise geared toward building interoperability between African and western partner nations. But the Niger deployment stands apart based solely on the Green Berets tasked with turning things around. Historically focused on Africa during the 1960s and since its reactivation in 1990, the 3rd Special Forces Group helped shape the course of the War in Afghanistan as the longest-running Special Forces group in the country, The Fayetteville Observer’s Drew Brooks noted in July. Ten members of the 3rd SFG’s ODA 3336 picked up Silver Stars for their heroism during the Battle of the Shok Valley (or “Operation Command Wrath”) in 2008, the most commendations for a single firefight since Vietnam. The soldiers of the 3rd SFG have been on the front lines of the Global War on Terror since 9/11, and with growing terrorist threats taking root across Africa, no special operations force has more counterterrorism experience than they do. Despite this, these elite soldiers have likely found themselves as spread thin as their fellow special operators in the Middle East. The 3rd SFG has had to retool its approach to support its realignment from Afghanistan to its role as the lead force provider for SOCAFRICA subcommand Special Operations Command Forward - North and West Africa, an area of responsibility that, on top of Niger, includes Algeria, Morocco, Libya, Chad, Niger, Nigeria, Mali, Mauritania, Senegal, Burkina Faso, Tunisia and Cameroon. “Going from a place where you’re side-by-side in combat with your Afghan counterparts to a place where the United States is not at war, but our partners are, is daunting as well,” he added.